Respondents to the Executive Opinion Survey are asked every year to identify and rank the five most problematic factors for doing business in their country. The scores calculated on the basis of the 2015 data are presented in the country profiles at the end of this Report. A comparative analysis of the results from 2007 and 2015 can help us understand how the global financial crisis has created new obstacles for doing business across the world, highlighted previously existing weaknesses, and changed the priorities of firms in countries at all stages of development (Table 1). The most striking change is the surge of access to finance as one of the most serious problems for business in many countries, a consequence of the global financial crisis (Figure 1). Because of deleveraging and stricter regulations in the banking sector, uncertain economic prospects, and despite extremely low interest rates, obtaining finance is still very difficult, especially for small- and medium-sized enterprises. In advanced economies, firms surveyed in 2015 indicate this factor as the 4th most pressing concern.1 This has more than doubled since 2007, when it was only 7th.2 Access to finance is now almost as problematic in advanced as in developing economies, where it has risen from 3rd in 2007 to become the number 1 priority (Table 1). Tax rates also climbed the priority list in both advanced and developing economies. In their quest for a reduction of debt and deficits, governments in many countries have implemented austerity measures that include new taxes that depressed business activity further. The analysis also reveals the persistence of institutional factors as top priorities in most economies, showing how difficult it is for countries at all levels of development to improve their institutional framework. Government bureaucracy is still the top priority in advanced economies and remains one of the three most pressing issues in developing economies; corruption—another factor related to governance—ranks second on the list. Corruption has gained in prominence especially in countries where recent scandals have exposed its economic costs, such as Brazil, Hungary, Italy, Mexico, and Spain. 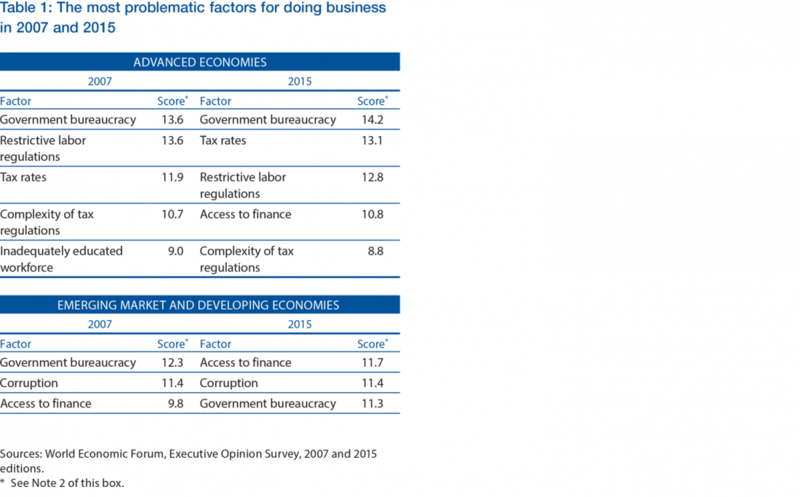 2 Respondents to the Executive Opinion Survey were asked to select the five most problematic factors for doing business in their country and to rank them between 1 (most problematic) and 5. The numbers presented in this box show the responses weighted according to their rankings. The historical scores have been adjusted to reflect the introduction of new factors to the list used in the Survey. For the list of problematic factors for each economy, refer to the Country/Economy Profiles at the end of the Report.